Tyrade gains 1 ad/level per ally within 1000 range. Allies in range gain 1 ad and ap per level within range of Tyrade. Tyrade slashes with both his massive swords in 2 overlapping cones in front of him doing (50,90,130,170,210) + .6*AD damage in a 500 range cone (per sword). Enemies caught by both slashes take double damage and are stunned for .5 seconds. This move applies on hit effects. Tyrade unleashes an invigorating roar increasing his and any ally within 1000 ranges movement speed by (10,15,20,25,30) % and gaining (25,25,30,30,35) + .2 *AD (ad and ap) for 4 seconds. Tyrade grabs the nearest ally within 300 range and throws them in a line (300-800 range / skillshot). If an enemy champion is hit they are stunned for .5 seconds and take (50,100,150,200,250) + (.8*AD) damage. 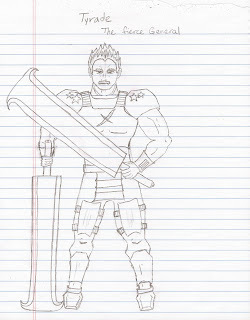 In addition the player thrown gains (5,10,15,20,25) MR and Armor. 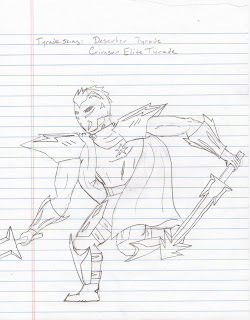 Tyrade leaps to a target location within 1000 range slashing in a circle (500 range) upon landing for (200,300,400) + (1*AD) damage to all enemies in range. This move applies on hit effects to all enemy champions. There he knelt before his executioner. Defeated, beaten, a failure, the young Demacian lieutenant knew his sentence. Entrusted with a sacred duty he had led his troops on a recon mission into Noxus. His elite troops lay in tattered pieces behind him. Thirty good honest men were dead at his hands. No, at their hands. Before him stood only three. Three legends. Their power unrivaled, they had destroyed his entire unit in mere seconds. They called themselves: The Crimson Elite. 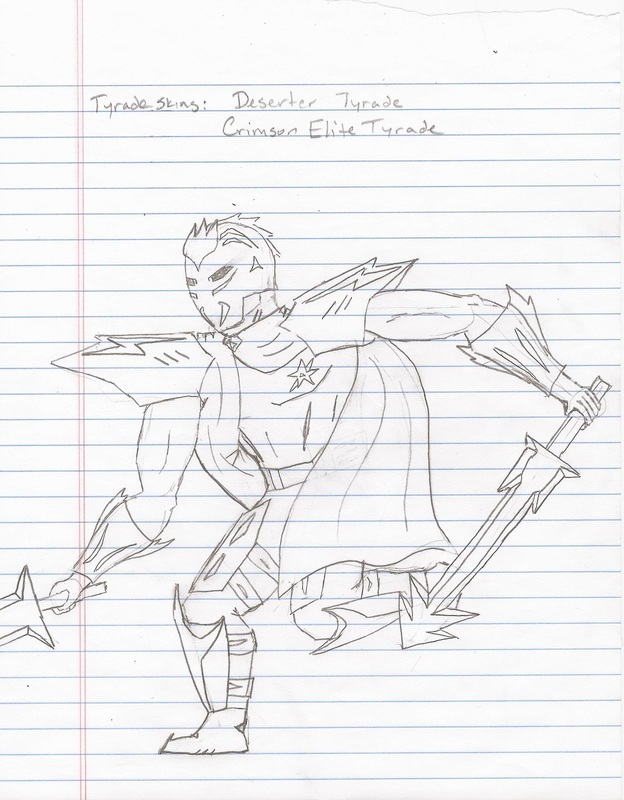 Talon, Riven, and their leader, the legend himself, the harbinger of death: General Tyrade. His massive swords crossed each other at the Lieutenant's throat and he knew his time was up. Demacia would never know of the invasion. He had failed. As his body fell to the ground the three red and black clad warriors strode off into the night, for no one invaded this sector of Noxus and ever lived to tell the tale.